Spain's Prime Minister Mariano Rajoy said it was a "jihadist attack". Two people have been arrested, but police say neither was the driver, who fled on foot. Early on Friday morning, Catalan police said an operation was taking place in town of Cambrils, to the south-west of Barcelona, in response to a "possible terrorist attack" and have told people there to stay indoors. 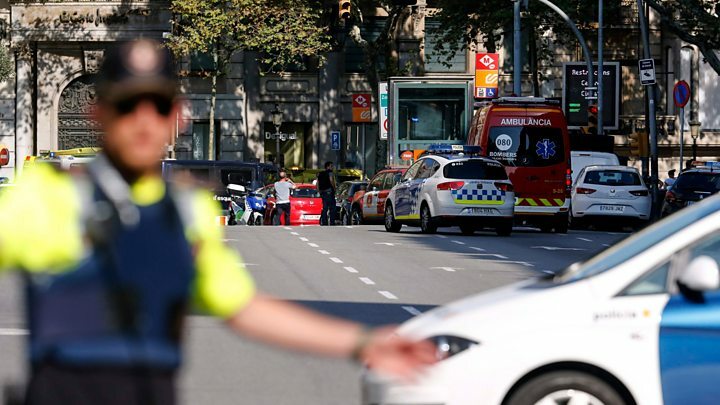 The authorities also say an explosion on Wednesday evening at a house outside Barcelona that left one person dead was connected to the Las Ramblas attack. Dozens of gas cylinders were found at the house in the town of Alcanar, about 100km (60 miles) south west of Barcelona, and Reuters quoted a police source as saying residents were preparing explosives. Police have released a photo of a man named as Driss Oukabir, whose documents were used to rent the van involved in the attack. 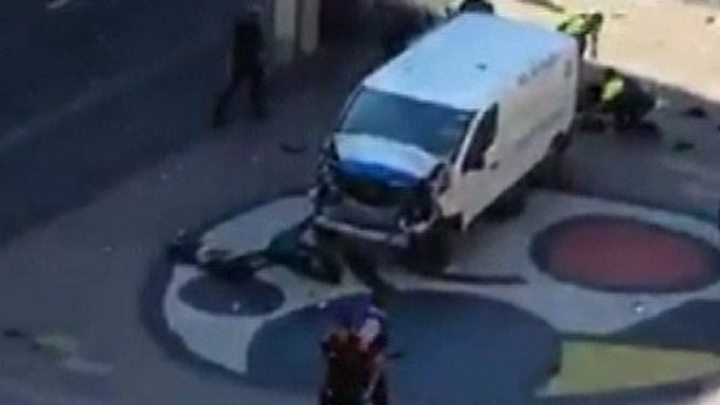 So-called Islamic State has said it was behind the van attack in Las Ramblas, saying in a brief statement carried by its Amaq news agency that it was carried out by "Islamic State soldiers". The group gave no further evidence or details to back this claim. 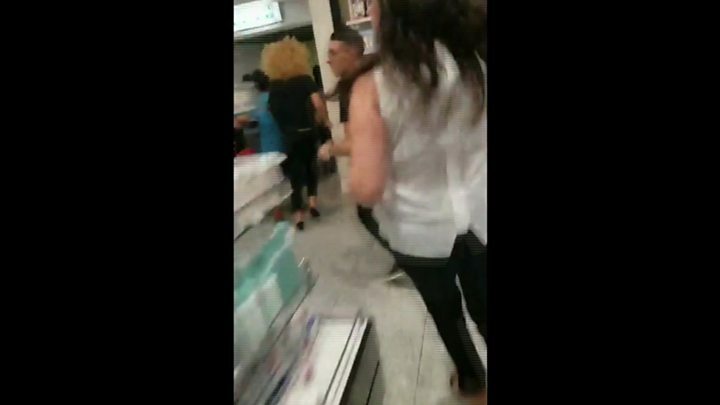 The attack happened at the height of the season in one of Europe's top tourist destinations. Prime Minister Rajoy has travelled to Barcelona and declared three days of national mourning. "Terrorists are defeated by unity," he said. Barcelona's mayor, Ada Colau, said the city would hold a minute of silence on Friday at midday. The United States has offered its assistance to Spain. Secretary of State Rex Tillerson also said consular assistance was being provided to Americans in the city, and urged US nationals to check in with their families. "Terrorists around the world should know the United States and our allies are resolved to find you and bring you to justice," he told reporters. UK Prime Minister Theresa May said her thoughts were with the victims, adding that "the UK stands with Spain against terror". French President Emmanuel Macron said: "We remain united and determined."